Ready To Use Detergent For Home Pressure Washers. Pressure Wash has been formulated for use in all types of household pressure washers. Use on gardening equipment & furniture! Looking for Ultimate Snow Foam? 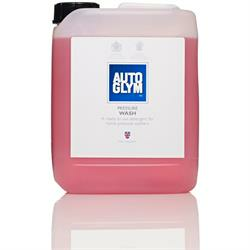 I'll admit to being an Autoglym fan but this is a useful product. The guidance on the container is accurate in that this pressure washer agent does not form a thick foam and is thus easily rinsed off. I actually bought this to clean a static caravan, although naturally I tested on my car first. It certainly breaks down well adhered dirt effectively after soaking for a few minutes. Agitation with a brush is essential. It cleaned both my car and caravan quickly and a little went a long way. Obviously, for car use, I would suggest this as a first step in a full regime, although I left my car untreated and the paint work is shiny and the water beads well.